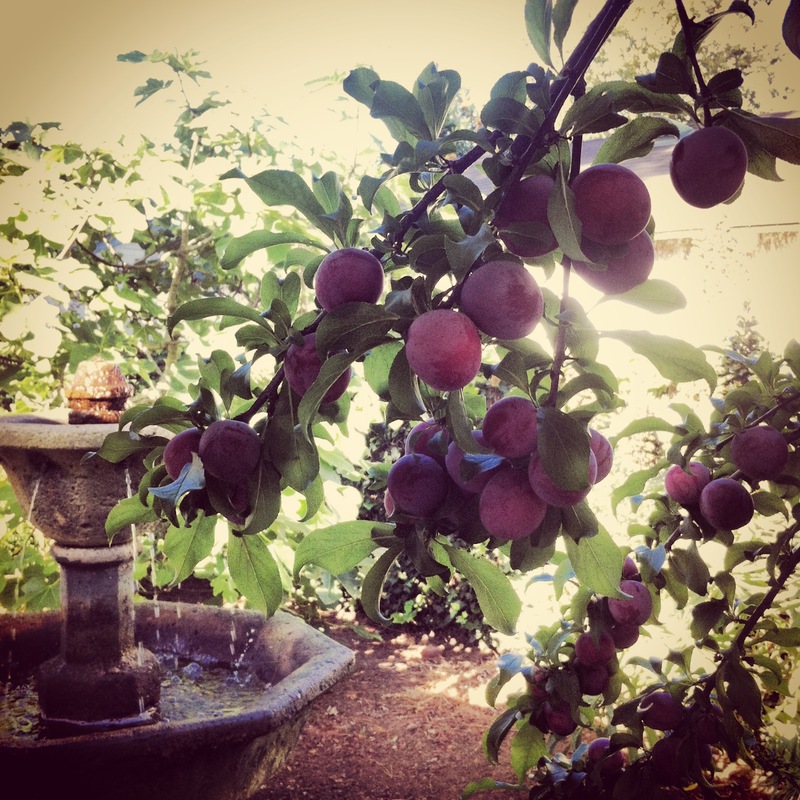 One of the first things we planted in our yard, when we moved to Santa Barbara thirteen years ago, is a plum tree. I adore caring for fruit trees, and we’ve always planted a variety of trees and other edible goodies on all the properties where we’ve lived. 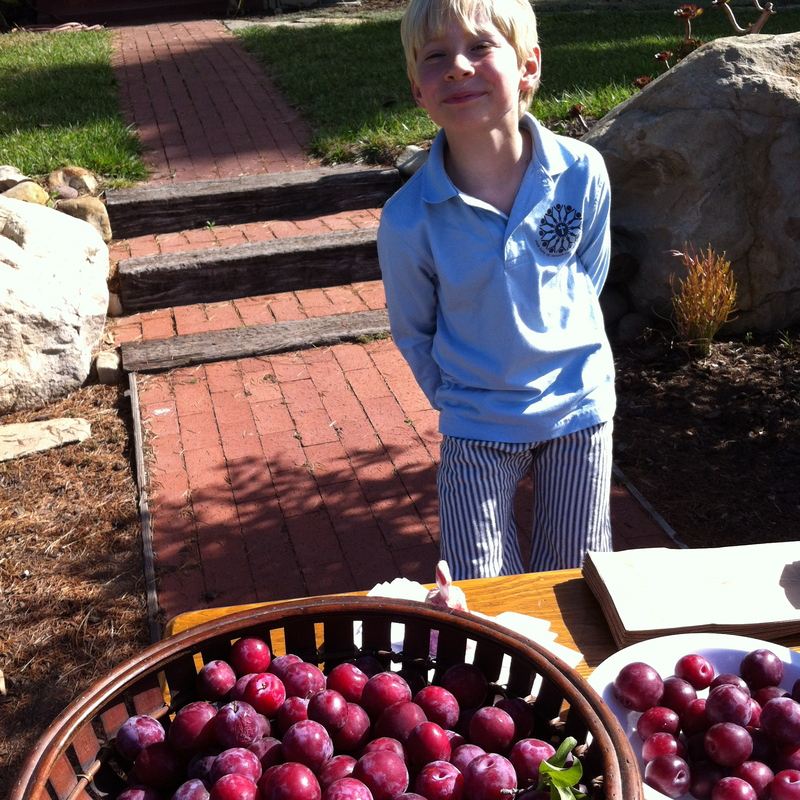 Our Santa Rosa plum gets plenty of sun, is carefully pruned (by me!!! I love pruning shears and ladders), and every year we have a three week blast of fruit that turns us into domestic plum mongers. We dash about, making jam, and fruit leather. We give bags and bags of fruit away, we make plum clafouti, and plum crisps, and we keep a bowl of fresh plums on the counter–that whispers an unspoken, mandatory message–MEYERS MUST EAT PLUMS NOW. This year, the bounty was overwhelming, and one Saturday we woke up to discover there was a garage sale happening right across the street. We hastily set up store, and this little mister made himself a $30 profit in a short morning of calling out to the folks perusing the old pots and pans at Cindy’s house. Because I love to share things coming out of my kitchen with folks, and because this summer has been more about sharing plum jam and kumquat marmalade, than bread, here is a recipe that I make year after year, sun or fog, that you might like to try! Put honey, lemon juice and cut plums in pot and stir. Let mash sit for an hour. Close your doors and shut your windows before you turn on the heat. Bees like to zoom in and examine what sort of honey you happen to be cooking with…. Clover? Orange Blossom? Wildflower? Bring mixture to a boil over medium heat, stirring and skimming foam with a large metal spoon. Cook at medium heat for about 20 minutes. Then reduce heat to a low, low simmer and cook another 30-40 minutes to reduce water content and thicken. Stir occasionally. Your jam is now done! You can scoop it into glass jars and keep it in the fridge for a long while, at least a month or two (or more–never really tried to see how long!). 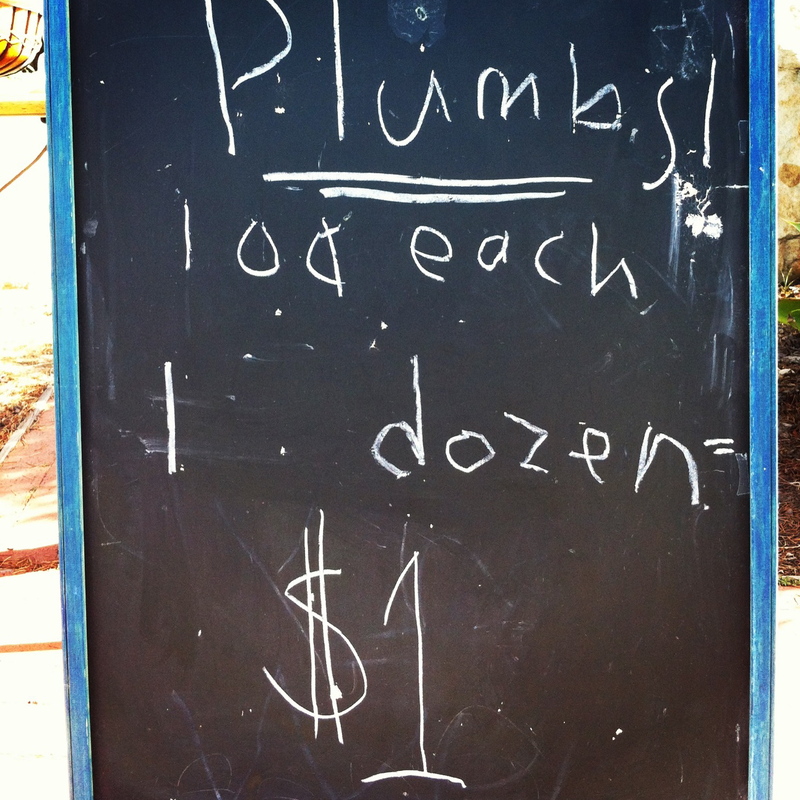 You can freeze it. 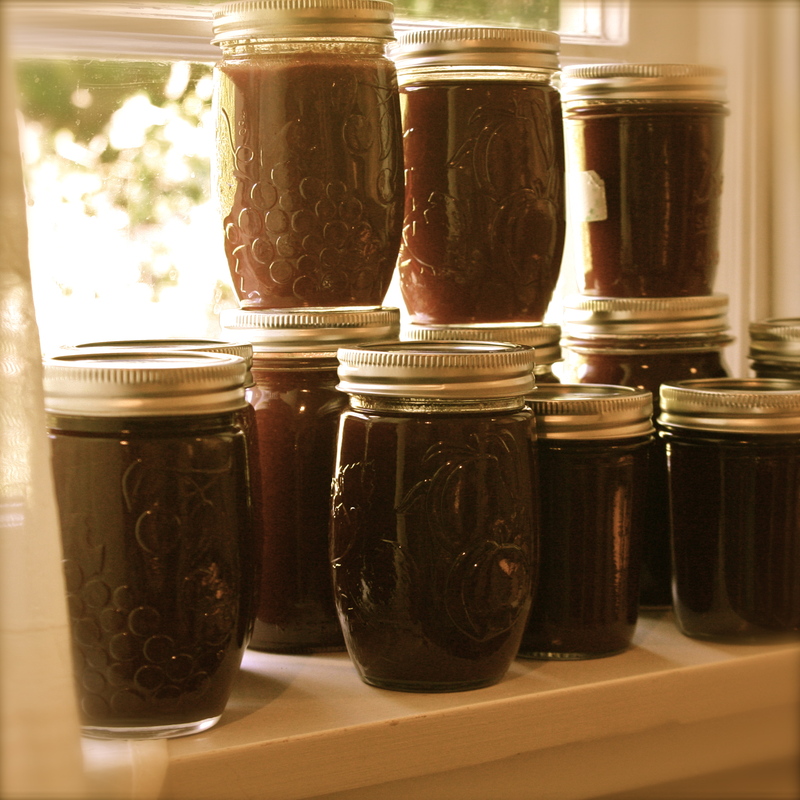 I always can a number of jars by ladling the jam into clean, sterilized mason jars, then processing them for 20 minutes in a roiling, boiling pot of water.